Over the past few months, I’ve heard so much about Norwegian Air. The buzz started in 2013 when the carrier announced it would begin its push into the US market with low fares on twice weekly flights to London, as well as flights to Oslo and Copenhagen from various cities in North America. Then, in 2015, after a successful stretch in the US market, the airline announced it would begin nonstop flights from the US to the Caribbean — I mean, who saw that coming — as well as accepting the delivery of 11 new aircraft and launching more routes from the US to Europe, and even domestic service within Spain. 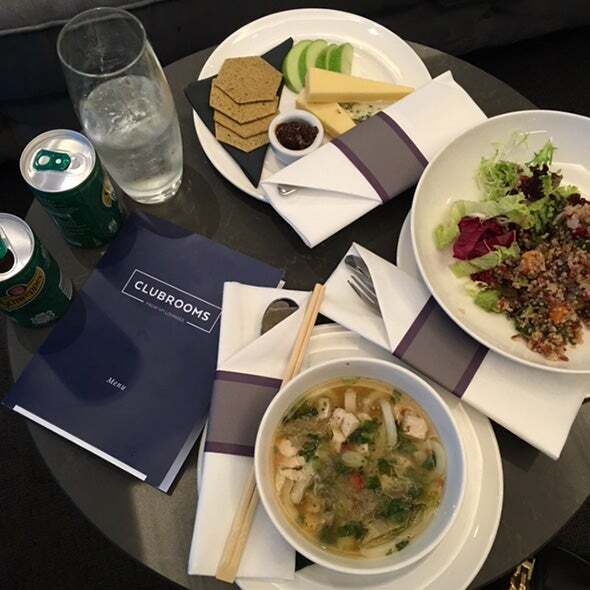 After hearing about all the great deals, both current and in the future, and positive feedback about the carrier, TPG Editor-in-Chief Zach Honig decided to try the airlines’ Premium Class product from New York to Oslo. And, much to my surprise, he really enjoyed it. So it’s been on my radar for a while, especially because it’s one of the most buzzed about carriers out of New York now, which is crazy. I was just waiting for the right opportunity to come around where I could jump on one of the airline’s low-fare tickets. And the opportunity finally presented itself when I decided to try out new products on a recent trip to London. 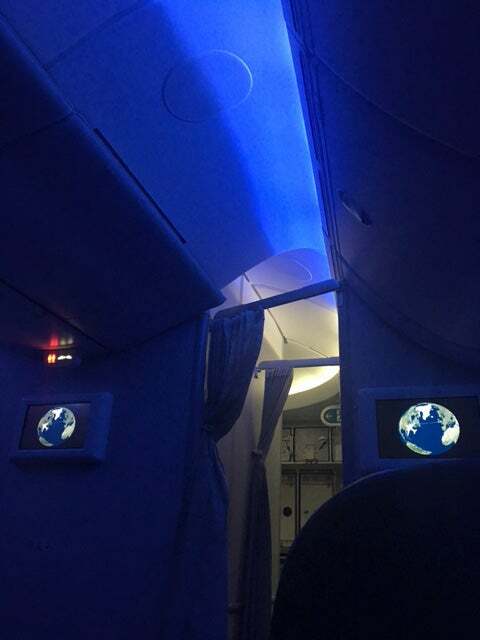 I flew there feeling adventurous and trying Kuwait Airways’ first-class 777 product, which was much less than a luxuriating way to cross the Atlantic, to say the least. 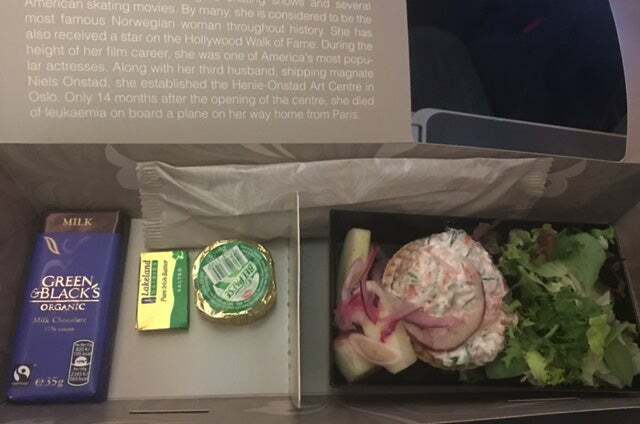 And, I would be returning from my London trip back to New York on Norwegian’s Premium Class product. Needless to say, I was excited to try it out. 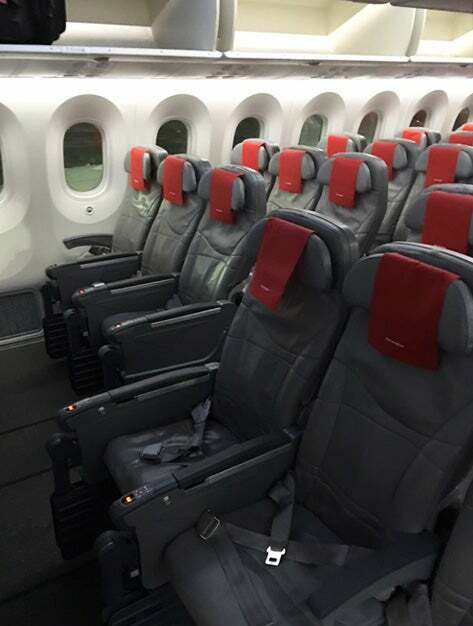 Norwegian flies its 787 Dreamliner on all of its long-haul flights. The aircraft has 32 Premium seats and a whopping 259 seats in standard economy. So, with that in mind, I decided to splurge on the Premium product to ensure that I had enough room for my more than seven hours on board. Norwegian has eight Dreamliners in its fleet today, but the carrier has ordered 30 more and plans to order or lease more from other airlines (such as LOT) in the future. It’s a much more fuel efficient aircraft, which makes it possible for carriers (such as Norwegian) to offer very competitive fares. As I pointed out in my points and miles travel wish list for 2016, airlines ordering new aircraft in an effort to be more fuel efficient is very important to me, and in 2015, Norwegian was named the most fuel-efficient Transatlantic airline by the ICCT. A sample booking of my flight on the Norwegian version of site. I paid 6,503 NOK ($732) for my Premium one-way ticket using my American Express Premier Rewards Gold Card to earn 3x points on flights booked directly with the airline. Don’t forget that you can save a bundle when booking by using the Norwegian version of the site as opposed to the English version — you’ll have to click through the prompts in Norwegian, but it’s easy enough to figure out. The airline does have a frequent flyer program, which isn’t all that great, however, I do recommend signing up because it can’t hurt. 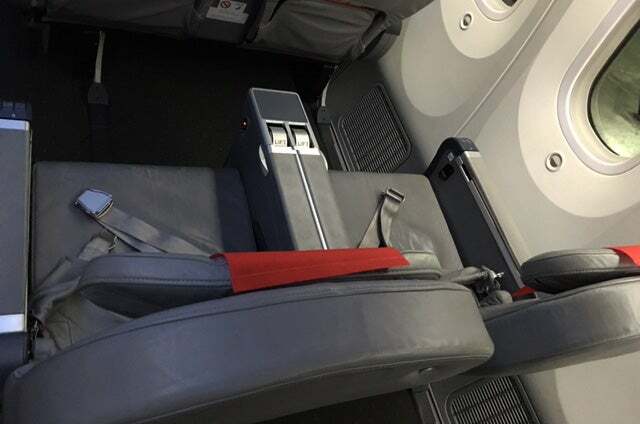 Although I really enjoyed the flight and my experience with Norwegian as you’ll see in my review, one of my favorite parts about the trip is the time of the flight, which makes it ideal for a quick weekend getaway. It leaves London at 5:10pm, so you can make the most of your time in London on Sunday before heading to the airport that evening. You then get back to New York around 8:30pm Sunday night — enough time to get back and settled in for work the next day. Premium upgrades were available for the flight upon checking in. Check-in at Gatwick was easy breezy. We were greeted by the friendly agent and immediately saw the signs that there were Premium upgrades available for the flight for 250 pounds (about $364). 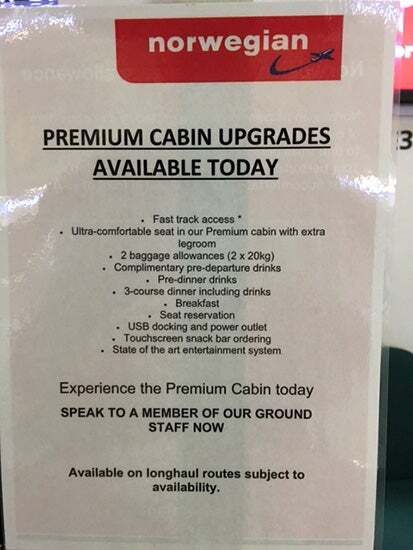 Signs around the check-in counter were advertising Premium upgrades. Premium will give you a number of benefits, including fast track access, extra legroom, a two baggage allowance, complimentary pre-departure drinks, a three-course meal with drinks, among others. Although I was already booked for Premium, there were four or five seats still open in the cabin, and I think the upgrade is definitely worth it if you’re booked in standard economy. The lounge was very chic — it looked new. And after a successful check-in, I was on my way to the lounge. 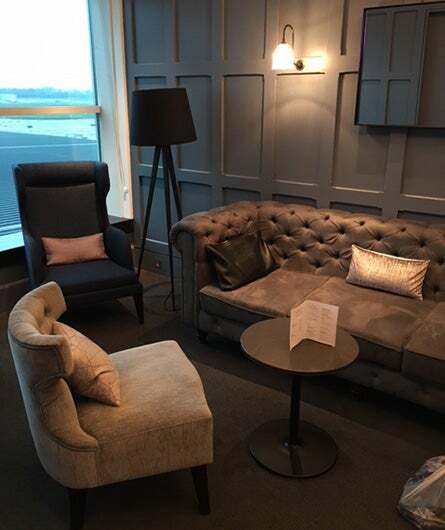 With a Premium ticket, you get complimentary access to the Clubrooms lounge at Gatwick in the south terminal — and it was honestly great (FAR better than the Korean Air lounge Zach got to use at JFK), which I was pleasantly surprised about. It had a real chic look to it with the furniture and overall look of the place. There was a TV, dedicated host and a large selection of magazines, newspapers and snacks to choose from. The couches were comfortable and looked nice. 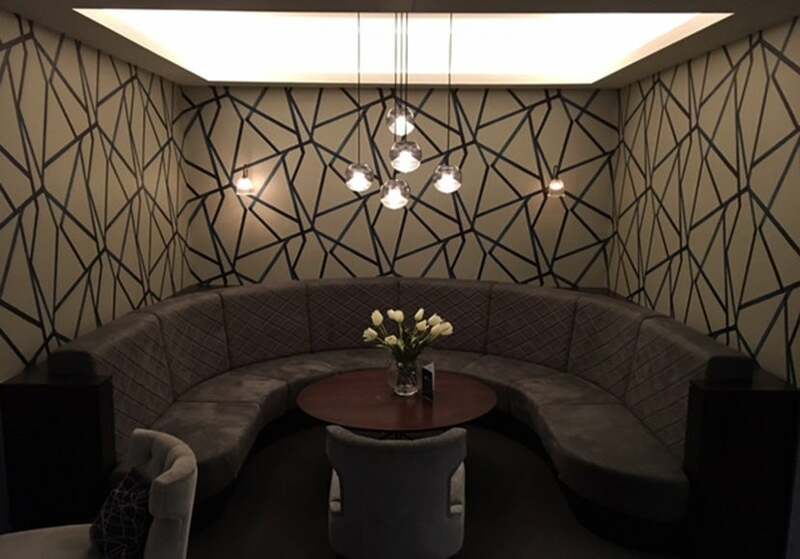 There were four private lounges inside the lounge itself, which could be a nice option to have some privacy. I really liked having the ability to be able to wander around the lounge and explore all there was to offer, which surprisingly wasn’t crowded at all, especially for a shared lounge. There was a nice selection of food and drink, and it was all pretty tasty. My impression of the lounge continued to improve with the complimentary food and beverage service. You order from a menu, which includes everything from snacks to appetizers to main courses and has a variety of options, including a winter beef stew and a fish finger sandwich. I chose the cheese plate, which was served with biscuits and chutney, and the squash and quinoa salad, which was served with kale and lentils, to start. For my main course, I chose the Asian noodle broth with chicken. Everything I had was pretty good, and I loved the fact that there were healthy options across the menu. Overall, I was very impressed with the lounge. Normally, shared lounges like this are not that great, so I didn’t have the highest expectations walking through its doors. However, I was pleasantly surprised with what I saw, the food I ate and the service I received. I felt really relaxed inside, which set the mood for the whole flight. Boarding started on time and was fairly uneventful. I have to admit, I was pretty excited to get on board and see what the interior of the aircraft would look like. Looking across a row of seats in the Premium cabin. The Premium cabin is comprised of 32 recliner seats in a 2-3-2 configuration. The seats are 19 inches wide and offer 46 inches of pitch. That being said, because of the formation I’d definitely plan to be on the sides to have even more room. A Premium seat reclined with foot rest. Each of the Premium seats offers a fair amount of recline, which was comfortable enough for me to get some good sleep. Each seat also comes with a foot rest that extends from the bottom for extra support (it’s not fully extended in the image above). Some people have mentioned that the first row of the cabin has the most legroom, but I disagree. I was in the second row and felt like I had just as much room as the people who were one row in front of me. I don’t know if that would have been the case if I were in one of the three middle seats. If you are stuck in one of the middle seats, avoid the “E” seat, as that’s the middle of the middle — no thank you. The standard economy cabin is in a 3-3-3 configuration. The standard economy cabin has a whopping 259 standard seats in a 3-3-3 formation. Each seat is 17.2 inches wide and has 31-32 inches of pitch. Not an ideal situation, but from my brief observation of the cabin, it didn’t look too bad. And, the overhead bin space on the Dreamliner is much larger than your average cabin, so there is plenty of room to store carry-on bags. If you’re sitting in the economy cabin, try to aim for seats A, B, C, D, E or F in row 6 or row G, H or J in row 7, as you’ll have the most legroom. The mood lighting before bed time really helped me get some sleep. There were some neat features on the aircraft that are definitely worth noting. First, the mood lighting is one of the cooler aspects. The crew selected a special mood lighting for when it was bed time, which was nice and actually helped me sleep a bit better. The air cabin pressure is also noticeably better than on other aircraft I’ve flown. And the windows are really neat, as each one has an individual dimming button or the crew can set the brightness for an entire cabin from a control panel near the cockpit. That way, they can set all of the shades to dark and keep the sunrise from waking passengers up too early. There are two lavatories in the Premium cabin, four in the middle section of the plane and two in the back — all of which are identical. They’re state-of-the-art with automatic faucets and motion-activated toilets, which is standard for the 787. I really enjoyed the blanket that came with my Premium ticket. However, what really stole the show for me and ended up being my favorite part of the flight was the blanket. 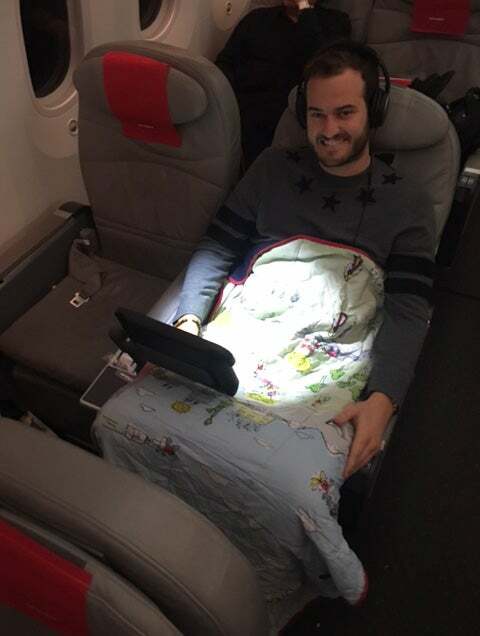 Norwegian gives Premium passengers an awesome blanket to use on the flight (as well as headphones, but the blanket was my favorite). It’s really the design that makes it so nice, which is a picture of the world drawn with all of these crazy Norwegian elements on it. The New York-based cabin crew could not have been nicer for the duration of the flight. 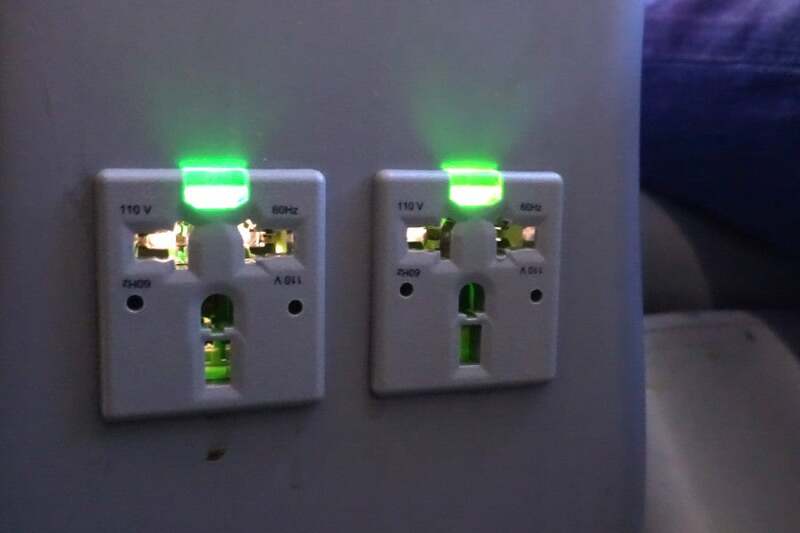 They were all very attentive and did everything in their power to assist in making the flight a better experience for all the passengers in the cabin. The egg salad was good, but the shrimp was pretty tasteless. 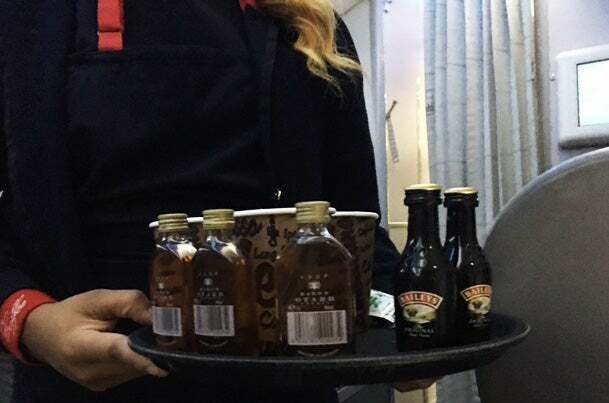 There were complimentary drinks offered during the three-course meal service, which was a nice sight after my six-hour dry flight to London. I ended up getting the prawn entree, which came out in a little box with egg salad and a brownie. The salad was really good, but the shrimp was pretty bland. 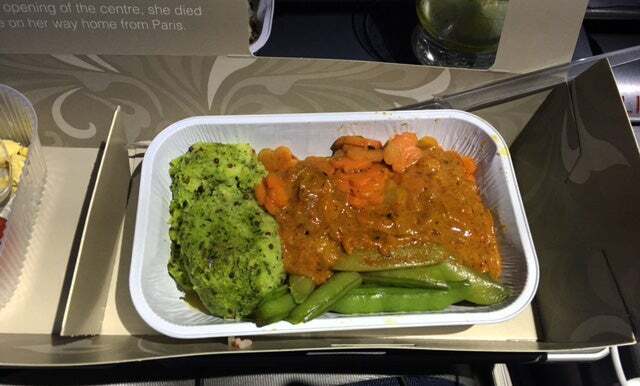 I switched to the chicken curry and was much more impressed. My friend got the chicken curry, which he said was great. I tried it and thought it had a lot of flavor, so I asked the FA if I could switch entrees, which she said was no problem. 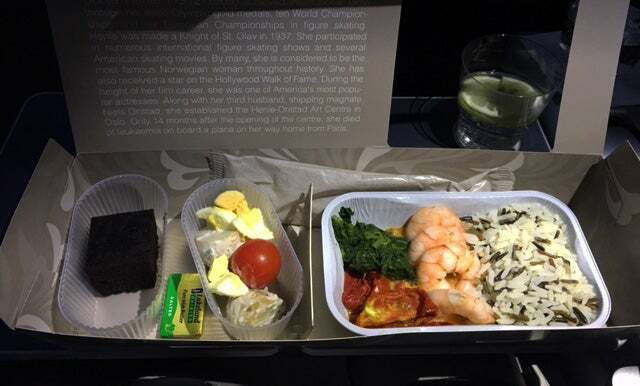 The service made the flight really stand out, and I was excited when my second entree come out a few minutes later and left me satisfied in a way the shrimp didn’t. 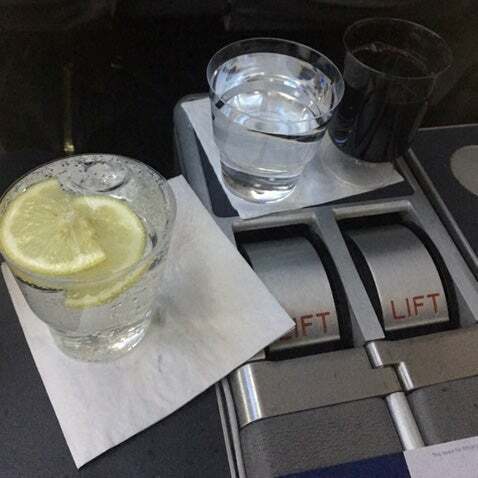 Loved the drink service throughout the flight. For the rest of the flight, any time we asked for wine or a new drink, the FAs brought it right over. It was really great to see how the crew was able to accommodate the passengers and their needs, no matter what they were. Another bonus of booking a Premium ticket. Cognac and coffee is a nice way to end meal service. After the meal, the FAs came around the cabin offering coffee — accompanied by a choice of Bailey’s or Cognac, a nice touch. 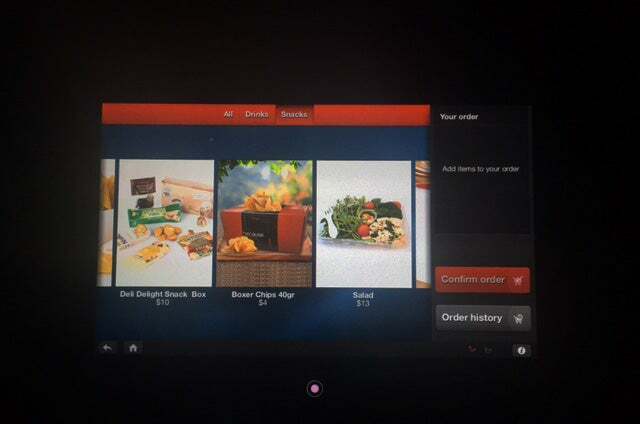 The in-flight entertainment screen/snack ordering service. After meal service was over, I took a nap. 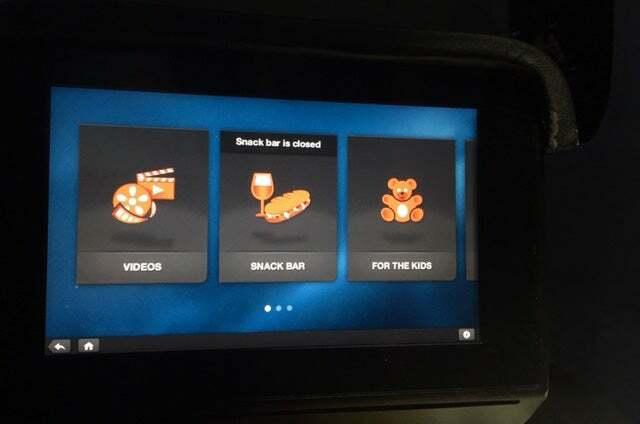 When I woke up, I was a little hungry and chose to order a snack from the in-flight menu, which is built into the touchscreen in-flight entertainment system. There was a wide selection of options, however, a lot of them weren’t available because they were either sold out or weren’t available on the specific flight. It was a little frustrating to go through the menu and find something you want, only to find out that it’s not available. So it took a little bit of time to eventually find something, but it was no big deal. I chose the chicken caesar and bacon salad — eventually — as a snack. I finally came across something on the menu that looked good and was available, which was the chicken caesar and bacon salad. It was OK — pretty standard, but nothing to write home about. I opted for the salmon sandwich as my second (official) meal before arrival at JFK. 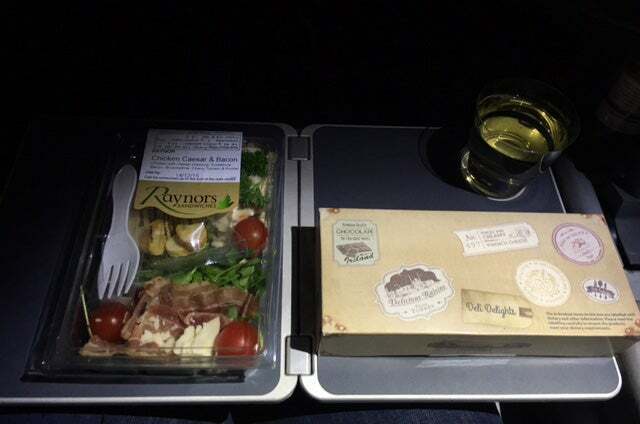 Right before landing, the FAs came around once more with a final meal service before arriving in New York. I opted for the salmon sandwich. It was a nice way to end the flight and send passengers off full from all of the food and satisfied with great service. I spent most of my time onboard Norwegian’s Dreamliner either sleeping or utilizing its in-flight entertainment system. It looked like there were many options to choose from on the screen, including the snack ordering as mentioned above and games, as well as new releases and older movies, TV shows and documentaries. I chose to watch the Amy Winehouse documentary, which I found fascinating and recommend. The screens were a little small, but the touchscreen was a neat feature to have and made it easy when selecting snack options. In the Premium cabin, in-flight entertainment screens come out of the armrest. 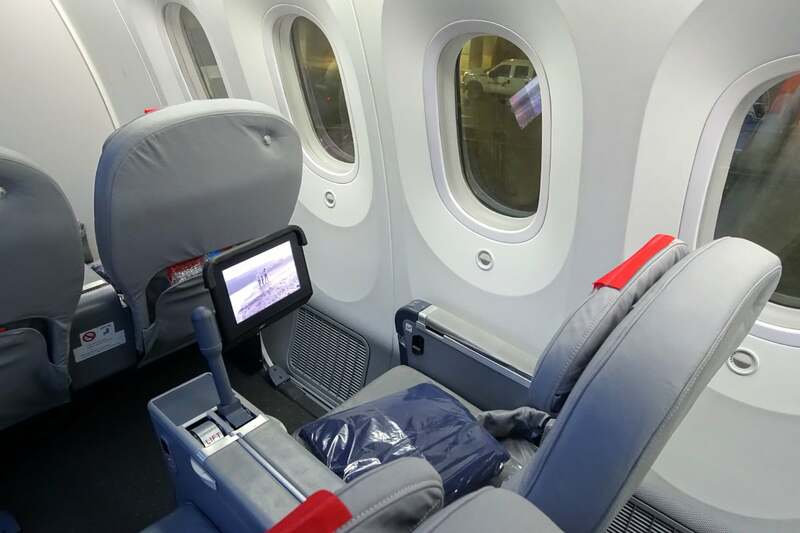 Whereas in the economy cabin, the screens are on the seat back in front of you, in the Premium cabin they pop out of the armrest. Unfortunately, this means you can’t use it during taxi, takeoff or landing. There were many options available from the in-flight entertainment touchscreen. There were some neat features on each of the screens, including a built-in card reader on the side of the screen where you can just swipe your card if you’re looking to make an in-flight purchase from a selection of duty-free items. There’s also a nice map feature that allows you to track where the plane is from a variety of magnification levels. You can control the screen either with a fixed remote on the side of the seat or from utilizing the touchscreen feature. Each Premium seat has its own power outlet, while there are two outlets for every three seats in economy. 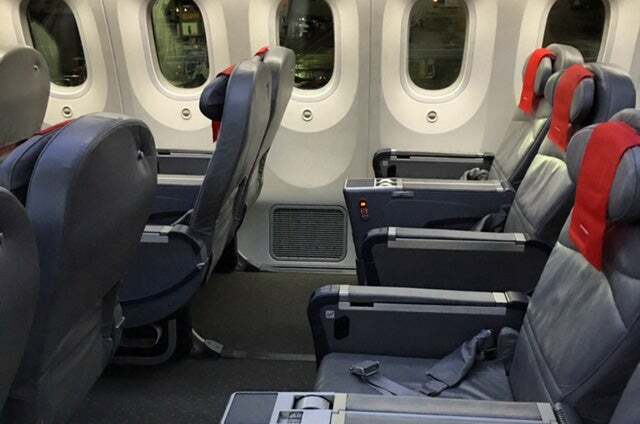 Overall, I was impressed with Norwegian’s Premium Class product — I mean, for a Premium economy service, this was great. My experience was solid across the board — from booking for a fraction of the cost of other carriers, to the smooth check-in and boarding processes, to the in-flight service. 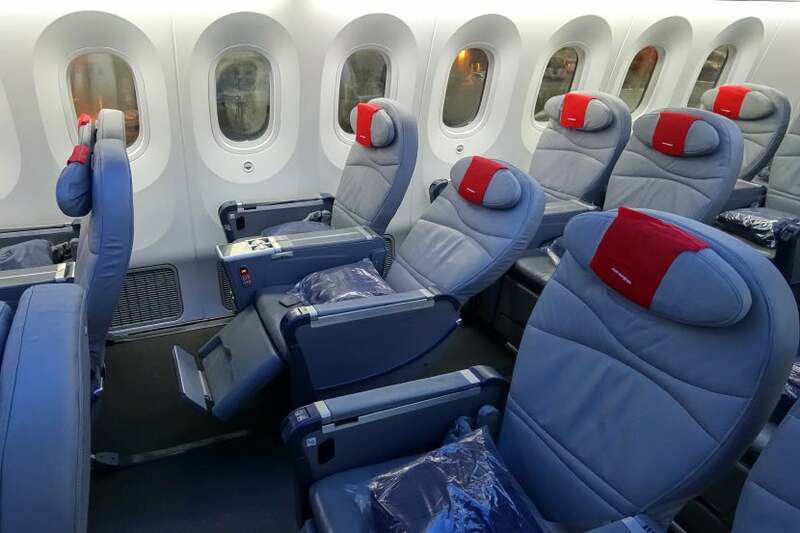 For around $730, Norwegian is a great way to get to and from London in comfort and for the price of coach on some other carriers. I really like that we now have options like this, La Compagnie and WOW Air for budget travelers, because why pay for all the bells and whistles if you don’t want them and only want a flight to get to your destination. It’s no surprise to me that Norwegian reported record high year-end traffic figures with 25.7 million passengers in 2015 — two million more than the previous year. Norwegian’s Premium product left me impressed with the carrier. I’m really excited for Norwegian to grow and become a competitive option for consumers. Currently, the airline flies nonstop from New York-JFK to Copenhagen (CPH), Guadeloupe — Pointe-à-Pitre (PTP), London-Gatwick (LGW), Martinique — Fort-de-France (FDF), Oslo (OSL) and Stockholm-Arlanda (ARN). I know I really want to go to Norway sometime next year, so being able to fly nonstop from New York to Oslo instead of having to connect through London is a great way to get there. That being said and because I was so impressed with this trip, you will likely see me on board Norwegian Air again in the near future.